Let’s be real when it comes to lying; no one is ideal or innocent. Surely your customers, employees, job applicants and bosses aren’t always honest to you. But you aren’t always honest to them as well. These might not be big lies, but it is likely that you are going to hear a couple of tales. According to the author of “Liespotting: Proven Techniques to Detect Deception,” Pamela Meyer, every day you might lie from 10 to 200 times. Well, most likely we are trying to bridge the gap between who we are and who we want to be. This is according to Pamela Mayer. We do that because we aspire to be the ideal spouse, boss or employee but that is not the case. You are entirely aware when we lie, but can you tell when someone is lying to you? Can you spot a liar? The truth is that it isn’t easy to know if someone is lying to you. Some people are bad liars, and you can spot them quickly, but some people are masters of deception. So what can you do to recognize the masters of deception? You need to examine what they say. Make sure to pay close attention to the phrases and words these people use in order to sideline all the doubts. 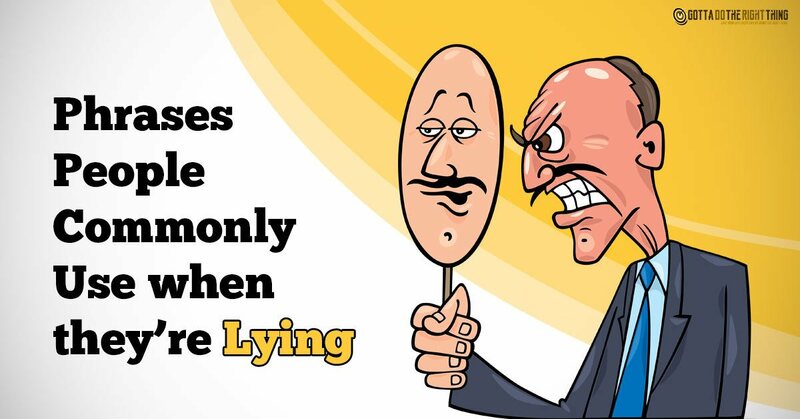 Usually, when liars use this phrase, they have an innocent expression on their face. And some have a mocking smile which is unbearable. Why do liars say this? It is because they want to turn the tables and accuse you at the end. They try to switch the defense mood you have and to change the purpose of the conversation. This is outright denial. Liars will try to deny everything at once. They know what you are confronting them about, but they don’t know what to say, so they play fools. These people don’t accept their lies. Stay away from them. Do you know what is typical for all liars – memory lapses? Those who lie need to keep track on their lies. And if you catch them lying, they will deny saying or doing that. In that way, they try to cover their deception. Once people say this phrase one thing is certain they are quality. Why? Because with this sentence they try to move the whole burden of the argument on your side. Often liars play on the victim card. They use it to make you doubt yourself and make you feel guilty. Why do liars repeat the same thing over and over again? They do this because they are trying to convince you. Also, by doing this, they are buying themselves time in order to make up another lie of gathering their thoughts. This phrase means that they have made a mistake, but there is no proof of it so there is no way they would admit it without evidence. You need to know that when someone talks too much and provides too much information which apparently isn’t requested, then most likely that person is lying. You will especially know this if there are too many details. Liars talk a lot since they hope that by doing that you will believe them? Liars don’t reply to your comments or questions; they begin questioning you. They do this to trap you, and so they won’t have to answer. So, if you notice that they are asking for any reasons for doing or saying something, they are lying. When a person withholds information, it is most likely because they want to be careful what they say. So if you notice that a person uses this phrase, you should know that they are lying or maybe keeping a secret. When people lie, they usually use formal language. For instance, they use “ I did not” and not “I didn’t,” or they use “I am” and not “I’m.” They do this so they will sound more convincing.